An amoeba is a highly motile eukaryotic, unicellular organism. Typically belonging to the kingdom protozoa, it moves in an “amoeboid” fashion. As such, microbiologists often use the term “amoeboid”, to refer to a specific type of movement and amoebae interchangeably. Interestingly, amoebae are not a distinct taxonomic group and are, instead, characterized based on their “amoeboid” movement rather than distinct morphological characteristics. Moreover, even members of the same species can appear dissimilar. Amebae species can be found in all major eukaryotic lineages, including fungi, algae, and even animals. Amoebae contain an endoplasm that is granular in nature. This granular endoplasm contains the nucleus and various engulfed food vacuoles. In addition, amoebae are eukaryotic by definition and possess a unique nucleus that contains a central karyosome with a thin layer of beaded chromatin coating the inner nuclear membrane; however, unlike many eukaryotes, amoebae are anaerobic. Thus, amoebae contain no mitochondria and generate ATP exclusively via anaerobic means. Amoebas can be classified as free-living and parasitic. Parasitic amoebas are ubiquitous and often parasitize higher vertebrates and invertebrates alike. Only a limited number of amoeba species are capable of infecting humans, and typically invade the intestine. Specifically, only Entamoebahistolytica represents a true human pathogen, which infects the gastrointestinal tract. A second gut pathogen, Dientamoeba fragilis, is commonly mistaken as an amoeba owing to its similar morphology under a light microscope. Indeed, D. fragilis was originally misclassified as an amoeba; however, modern methods have identified it as a nonflagellate trichomonad parasite. Interestingly, some free-living amoebas can cause opportunistic infections in humans, leading to eye infections, as well as various neurological, and cutaneous (skin) infections. the rear portion of the amoeba releases its attachment to the substrate and is propelled forward. During amoeboid movement, the viscosity of the cytosol cycles between a fluid-like sol, which flows from the central region of the cytoplasm known as the endoplasm into the pseudopodium at the front of the cell. Once this occurs, the endoplasm becomes an ectoplasm containing a gel-like substance that forms the cortex under the plasma membrane. 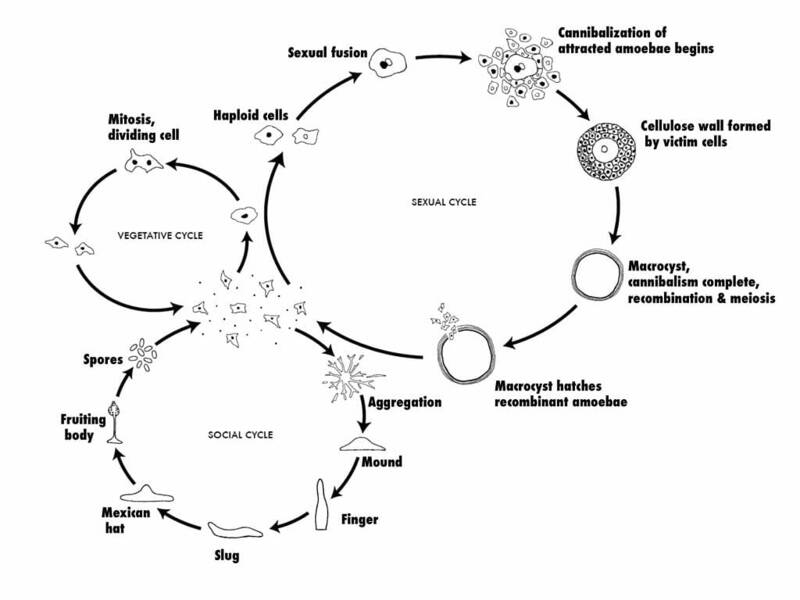 As the amoeba moves forward, the ectoplasmic gel is converted once again into the endoplasmic sol, and the cycle is repeated as the cell continues to move. This transition between the gel and sol states occurs following the collapse and reassembly of networks of actin microfilaments located in the cytosol. In particular, cofinin is responsible for the disassembly of actin filaments to form the sol, whereas profilin leads to actin polymerization and the gel is formed by α-actinin and filamin. Amoebae differ in both size and shape, and even members of the same species can be highly morphologically distinct. While the earliest identified amoebae were approximately 400 to 600 microns in size, both extremely small (between 2 and 3 microns) as well as exceptionally large amoebae (20 cm; visible to the naked eye) have been documented to date. Therefore, amoeba species exhibit a wide range of sizes. Indeed, when scientists study amoebae, the samples are typically passed through a filter approximately 0.45 microns in size, and the remnants on the filter are used for culturing. Since amoebae both move and eat using pseudopods, they are classified based on the morphology and internal structure of their pseudopods. For example, Amoebozoan species (e.g., amoeba) exhibit bulbous pseudopods with a tubular mid-section and rounded ends; Cercozoan amoeboids, (e.g., Euglypha and Gromia) have pseudopods which appear thin and thread-like; Foraminifera produce slender pseudopods that branch and merge with one another to form net-like structures; others are characterized by rigid, needle-like pseudopods with a complex network of microtubules. Free-living amoebae (which do not require a host) are either “testate” or “naked”. Testate amoebae contain a hard shell, whereas naked amoebae do not. Testate amoebae shells are typically composed of calcium, silica, chitin, or other components (e.g., sand granules). Another component typically found in freshwater amoebae is a contractile vacuole. This vacuole is required to expel excess water from the cell and maintain an osmotic balance. Since the concentration of solutes in freshwater is lower than the amoeba’s internal cytosol, water flows across the cell membrane via osmosis. Therefore, the contractile vacuole pumps this excess water out of the cell to ensure that the cell does not burst. In contrast, most marine amoebae do not possess a contractile vacuole as the cytosol and the water outside of the amoeba are balanced. Due to the extremely diverse nature of amoebae, the various species of amoebae reproduce using a variety of different methods. These methods include spores, binary fission, and even sexually. By far the most common form of asexual reproduction employed by amoebae is binary fission. 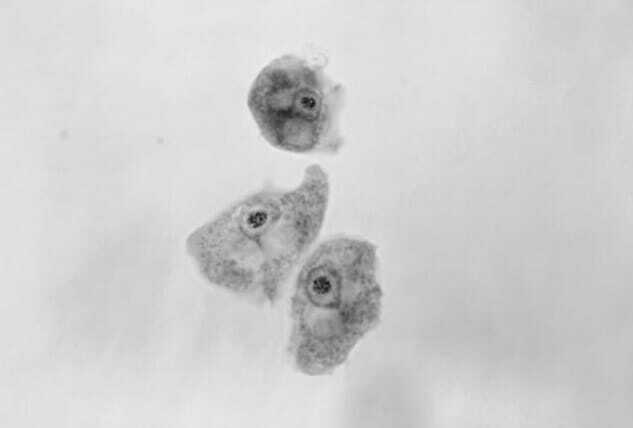 In preparation for reproduction, the amoeba will withdraw its pseudopodia and form a spherical shape. Mitosis is observed in the nucleus, and the cytoplasm divides at the center of the cell and separates, forming two daughter cells. Since this process involves simply copying the genetic information to form a second cell, the two resulting daughter cells are identical clones of the parent cell. Thus, the nucleus is absolutely essential for this form of reproduction. This has been verified in experiments involving slicing an amoeba in half or extracting the nucleus from the amoeba. In both situations, the cell eventually dies without a nucleus. when favorable conditions return, the cyst wall bursts, releasing the daughter cells. Within a host, the amoeba will undergo encystment as a means of protection against desiccation as it travels through the colon, which ensures its survival outside of the host. Solitary haploid amoebae (known as myxamoebae or “social amoebae”) reside on decaying vegetation (e.g., logs), eat bacteria, and reproduce asexually via binary fission as described above. However, unlike the amoebae, which undergo encystment when the food supply becomes exhausted, tens of thousands of myxamoebae will fuse, forming a moving stream of cells converging at a central location. It is at this region that the cells stack on top of each other and form a conical mound termed a “tight aggregate”. Next, a tip rises from the top of the conical mound and the tight aggregate folds to produce a mobile “grex” (also termed a pseudoplasmodium or slug), 2–4 mm in length and surrounded by a slimy substance. The grex will then migrate towards an illuminated area, where it will differentiate into a fruiting body composed of a tubed stalk (approximately 15%–20% of the entire cellular population) and spore cells. This process involves the secretion of an extracellular coating and the extension of a tube through the grex by prestalk cells located in the anterior of the grex. As the prestalk cells differentiate into stalk cells, they create vacuoles and become enlarged. This serves to lift the prespore cells in the posterior section of the grex. The elevated prespore cells differentiate into spore cells and disperse, each representing a new myxamoeba, while the stalk cells die. Myxamoebae are also unique in that they can also reproduce sexually. This occurs when two myxamoebae fuse to create a giant cell. This giant cell will then engulf all other cells in a myxamoebae aggregate. After ingesting all of its neighbors, the giant cell will encyst itself, and undergo meiosis and mitosis division a number of times under the protective cover of the cyst. When appropriate environmental conditions are met, the cyst will burst, releasing new myxamoebae. Since this process involves meiosis and the genetic information from two amoebae, the resulting daughter cells will be genetically distinct from the parent cells. Temperature is a critical factor which impacts the amoebae growth. While several amoebae species have been found to grow at a wide range of temperatures ranging from 10°C to 37°C, pathogenic strains have been found to survive more efficiently at higher temperatures (between 32°C and 37°C). This indicates that amoebae are highly resistant to temperature fluctuations and most are adapted to survival within humans. Therefore, this may have pathogenic implications, as amoeboid cysts are extremely resistant to microbicides and can infect humans via contaminated drinking water. 1. What is a “grex”? A. A method of phagocytosis. B. The joining of myxamoebae to form a giant slug. D. An amoeboid daughter cell. B is correct. A grex is formed by the aggregation of several myxamoebae in the process of migrating to another location to spore. 2. Which is NOT a method of reproduction exhibited by amoebae? D. All are forms of amoebae reproduction. D is correct. These are all forms of reproduction exhibited by amoebae. B. Dormancy until favorable conditions are achieved. D is correct. Amoebae form cysts for protection against harsh environmental conditions (e.g., the human colon) or to lie dormant until favorable conditions facilitate the release from the cyst. Baron S, editor. (1996). Medical Microbiology, 4th. ed. University of Texas Medical Branch at Galveston Garland Science: Galveston (TX). Farra et al. (2017). Free-living amoebae isolated in the Central African Republic: epidemiological and molecular aspects. The Pan African Medical Journal. 2017;26: p. 57. Levy, J. (1924). Studies on reproduction in amoeba proteus. Genetics. 9(2): pp.124-150. Lodish, H., Berk, A., Zipursky SL, et al. (2000). Molecular Cell Biology. 4th edition. W. H. Freeman: New York.